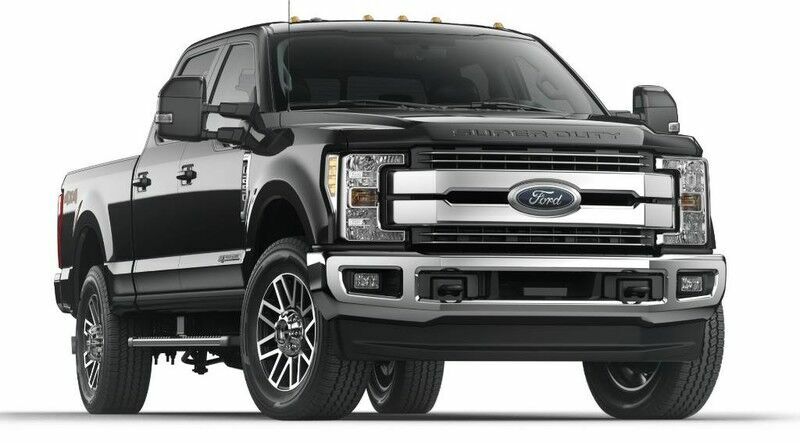 It's easy to fall in love with our 2019 Ford F-250 Lariat Crew Cab 4X4 that's tougher than ever before in Agate Black! Powered by a massive 6.2 Litre V8 that delivers 385hp while connected to Ford's TorqShift 6 Speed Automatic transmission so you can manage even the most stringent tasks without a second thought thanks to massive payload/towing capabilities. This Four Wheel Drive Lariat pick up helps you take charge of your day with its commanding stance that won't be ignored with its alloy wheels LED headlights/fog lights, and distinct chrome 2-bar-style grille. The Lariat cabin is set-up to help you take your day to the next level with everything perfectly in place including keyless entry, power locks/windows, a power sliding rear window, dual-zone climate control, and an LCD productivity screen. You'll feel as though you can take on anything behind the wheel snug in your highly adjustable leather-trimmed seat with power adjustable pedals, a leather-wrapped steering wheel, and Sync 3 touchscreen with voice-activated technology that helps you keep your eyes on the road and your hands on the wheel so you can maintain that ever-important connection. Buckle up, turn on your favorite tunes courtesy of the Premium Sony AM/FM/CD audio system with available satellite radio, and enjoy the ride! The fully boxed high strength steel frame of our Ford F-250 provides peace of mind along with SOS post-crash alert, MyKey, parking sensors, a rear camera, trailer sway control, blind spot monitoring, and more. Reward yourself with this strong machine that's big on luxury and capability! Print this page and call us Now... We Know You Will Enjoy Your Test Drive Towards Ownership! Blackstock is proud to be a premier Ford and Lincoln dealership in the Orangeville, Ontario area. From the moment you walk into our showroom, you'll know our commitment to customer service is second to none. Whether you need to purchase, finance, or service a new or pre-owned Ford or Lincoln, you've come to the right place. This 2019 Ford Super Duty F-250 SRW XLT is proudly offered by Blackstock Ford Lincoln There's a level of quality and refinement in this Ford Super Duty F-250 SRW that you won't find in your average vehicle. Take home this Ford Super Duty F-250 SRW XLT, and you will have the power of 4WD. It's a great feature when you need to drive over tricky terrain or through inclement weather. There is no reason why you shouldn't buy this Ford Super Duty F-250 SRW XLT. It is incomparable for the price and quality. Just what you've been looking for. With quality in mind, this vehicle is the perfect addition to take home.